The TEMPO of the all-duple structure allows us to choose the half note as a comfortable beat value. Our hyperbeat is the typical one: the whole note represents a full measure. For analytical purposes, we would now have a choice of a four-bar or two-bar hypermeasure; the two-bar will be chosen as it makes the interaction between phrase rhythm and hypermeter easier to comprehend. The two-bar hypermeasure is expressed in the metric structure by the double whole note. We now should be able to conduct the music in two, with the whole note as the beat. Try it, with a downbeat in the first bar and continuing with a duple conducting pattern. Because the first phrase unit is 5 bars long, the second (mm.6-9) and third units (mm.10-13) now begin on weaker second beats. The elision has lost its punch—it no longer disrupts the duple pattern, falling into place as just another downbeat. Try it now beginning with an upbeat. Everything now falls into place. Measure 6 and measure 10 are beginning downbeats; the elision arrives “early” and regains its dramatic effect. But how can we interpret the initial forte whole note ‘d,’ the longest note in the first unit, as an upbeat? A way out of this seeming dilemma is to recall that phrase expansion disrupts regular hypermeter, and Mozart has begun this symphony with a disruption! This statement begs the question: "How can you disrupt a phrase that has not yet been heard?" One way to reconcile this is to recognize successive downbeats: the loud, long-note accented ‘d’ followed by the two-octave contour accent in the second measure. We will have to conduct this by using two downbeats to begin. We are now expressing the expansion of the phrase, five whole notes, counted: 1-1-2-1-2. The duple pattern can be continued until measure 12, where it breaks down once more, the second weak beat being overwhelmed by the elision, with its forte dynamic and full orchestration. We can express this also by using succesive downbeats, this time at the end of the phrase unit, counted (starting in m. 10) 1-2-1-1, the final count 1 heard as beginning the next phrase. See Example 61, with the counts shown above the staff. Conduct the hypermeter, either with a recording, or better, with a mental performance. 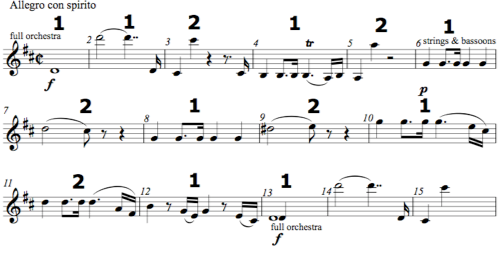 Use a large and decisive motion for the first five bars, a much smaller beat for bars 6-12. The last downbeat at the elision should once again be emphatic. A way to characterize the interaction of phrase rhythm and hypermeter is that phrase rhythm provides the music’s architecture, and hypermeter, when conducted, provides a dance through that architecture. In an important sense, the study of rhythm is...the study of all musical elements, the actions of those elements producing the effects of pace, pattern, and grouping which constitute rhythm.